The most annoying thing about playing Clash of Clans is that you sometimes have to wait around to get things done. So what do you do in those patches of downtime? Go about your daily life? Surely not. Why not instead play another one of the games like Clash of Clash to keep that addiction fuelled. 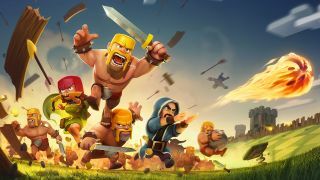 We’ve played as many games like Clash of Clans that we could find in the App Store and on Google Play, and whittled that long, long list down to these ten greats. So get downloading. While Age of Empires: Castle Siege isn’t a patch on the Age of Empires games of old, it is a brilliantly themed Clash of Clans alternative. Graphically, it’s almost a hark back to Age of Empires 2’s style, and your base can end up looking quite wondrous and imposing. Unlike Clash of Clans, you can actually control your units on the battlefield too, making this much more about tactics but without losing the intuitiveness of point-and-click control schemes. It won’t scratch your Age of Empires itch, but it will stave off some time until Age of Empires 4 arrives. Despite some fierce competition, it’s safe to say that Call of Duty is still one of the most popular shooters out there. But that hasn’t stopped it making a move to dominate the base-building world too with Call of Duty: Heroes. This freemium title isn’t just a straight Clash of Clans clone though, it brings some interesting features with it in an attempt to differentiate itself from the rest of the pack. And the biggest of those os the ability to call in heroes from the Call of Duty series itself, including John ‘Soap’ McTavish and Captain Price, which each have their own skills that can really turn the tide of battle. We also love the fact the game rewards you with premium currency and other items, just for logging in every day, making it one of the more generous titles in this collection. If you want something a little more intense than Clash of Clans, then you need to take a look at Total War Battles: Kingdom. There’s war, there are battles, but more importantly, there are also kingdoms for you to build. You’ll be responsible for developing its infrastructure, building and it’ll even make you feel like a God by allowing you to terraform all over the place. It’s actually a lot less about the clashing and more about the clans, but it’s got so much for you to do within it that you’ll soon forget that. Of course, there are battles with all kinds of units to unlock and command, but it feels much more like you’re evolving and building your army from scratch than other games in this genre. Star Wars: Commander is what happens when you smash Clash of Clans and Star Wars together. It’s a Star Wars-themed building game that follows the successes of Clash of Clans very well, but gives you the option of siding with the Empire or the Rebels. The Empire gives you access to their war machines like the AT-AT, while the Rebel Alliance route gets you Chewie and Han Solo. Tricky choice? It’s brilliantly animated, it oozes Star Wars charm, and all the licensed characters look top notch. There’s even a robust single-player campaign for you to power through, complete with story! It’s a Clash of Clans clone that’s worth your time, but especially if you’re a Star Wars fan. The best thing about DomiNations is that it’s basically a mobile version of Sid Meier’s Civilization, as it’s actually designed by Brian Reynolds who worked on Civilization 2. You work your way through a huge timeline of historical eras, seeing your buildings evolve and getting access to more advanced technologies as you progress. It’s absolutely gorgeous to look at - the bigger the screen, the better for this one. Plus, you can raid like you normally would in Clash of Clans. Winner. Gone are the days where you fight each other asynchronously, because Guardian Kingdoms is all about fighting together. During any battle, your allies can jump in and back you, often really helping you come out on top. It can result in a simple quarrel evolving into these big sprawling warzones too, either one-sided or with both of you calling for backup. Guardian Kingdoms manages to keep the Clash of Clans formula at its core, with its accessibility and ease-of-play, but it also harks back to the grand old days of Age of Empires with the huge armies and those epic battles. Avast me hearties! There be a Clash of Clans wannabe that’s all about the pirate life, which is the life for me. It’s full of gold and grog (which is actually an in-game currency), and that same gameplay that you know and love. Parrots and eyepatches are included. But there are some elements setting Plunder Pirates apart, from exploring unchartered isles to discovering new lands and ships, and even mapping out monsters, merchant ships and landmarks to explore. Just watch out for those tentacles. The best thing about Jungle Heat is its accessibility, making it serve as almost the gateway drug for Clash of Clans or something more intense like Total War Battles: Kingdoms. It has all the features of its inspirations, but it’s far more drip fed, allowing you to appreciate all its nuances in your own time. It might not be the right clone for everyone, but it does play a treat and offers some great multiplayer tactics, like being able to look at an enemy’s camp by spending a little gold before you go in all guns blazing. You should try Dawn of Titans for the graphics alone. Compared to any of the games in our list, it’s a seriously impressive visual achievement, especially when you start zooming in and out of your floating kingdoms to check out the titular Titans. But you should also play it because it’s doing some rather awesome things with controls, as you’re able to tell your troops exactly where to go with a level of heightened precision. Plus, this is a game with an extensive single-player campaign, meaning it’s got another string to its bow in contrast to the battle-and-build focus of the other titles in this list. You’ve got to hand it to Supercell, because this is a developer that really knows how to make a freemium base-building game. Although on the surface Boom Beach is basically the same as Clash of Clans but with a tropical island theme rather than a Norse kingdom, Boom Beach’s gameplay is actually deeper and more satisfying than Clash of Clans. The combat gives you much more control and better tactical abilities than Clash of Clans, making you always feel like you’ve earned your victory, rather than just paid your way to a more powerful army.